What if you were a ember, a spark that could ignite a revolution? There are some books that you just don't expect to be that good- you think you've read the best the genre has to offer, and then, once again, something leaves you so shocked; so numb, that getting into another one is impossible for quite a while! 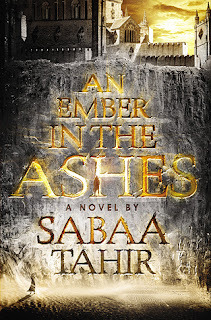 An Ember in the Ashes is definitely one of those books. Don't get me wrong- I was always expecting a really good book, but what I got blew me away completely. Oppressed for generations, The Scholars live with earning next to nothing, living in fear of raids, of imprisonment, or simply disappearing in the dead of the night and never be heard of again. Not even by the people who love you them the most. The once great Scholar empire, trembling at the hands of the Marshals that conquered them. Even though The Resistence has been working for years, it has never succeeded. They are just rumours at every child hears of- ones where they break people out of prison, ones where they can make people leave this land and escape to the free land. But association by them is punishable by death. After such horrendous torture that you're practically begging for it. The Masks are the Marshal's strongest weapon. Trained from an early age to be the most cold-hearted, dangerous assassins to help keep Law and Order in the Empire, they are what haunts the Scholars- they are killers without remorse. Elias Veturius is one of these Masks, about to graduate and inflict a world of pain onto the Scholars. Laia is a Scholar, who was apprenticing to become a healer, until a Mask in a nighttime raid took her only brother away, for possible association with the Resistance. Left with nothing, Laia has but one choice. Find the Resistance. Even if it means death. If there is one thing I didn't expect from An Ember in the Ashes, it was the brutality. There were no pretty palaces with cunning games being played. There were no princes or their swoony admirers. This was set in the front lines, with fights, loyalty, slavery, magic and death with no sly pretences. And I loved EVERY moment of it. I loved that this wasn't love at first sight, that the characters were more than two people that fell in love and fought for a happily ever after, but that despite their attraction, they were still fighting for the same purposes that they were before each other. Which is how it should be. I loved how there were other characters with stories brought to the front and not just two main characters. I loved how loyalty and freedom played such a big part in this, because it is, in a way, a military based story. And I'm rambling- but I did love it! POINTS AGAINST: A sort of insta-love. To conclude, An Ember In the Ashes is a brutal, harsh and real story cunningly woven with magic and myth, loyalty, betrayal and freedom and family and friends to produce a marvellous book! 5 stars!